Thanks to the NDA’s online Asset Transfer Scheme, Dounreay has acquired a third fire engine. The scheme enables redundant equipment to be re-used and recycled across NDA's estate. Since the Sizewell site, in Suffolk, completed defueling, its fire team has been disbanded. So they were looking to re-home the site’s firefighting equipment. They entered details of the equipment on the NDA’s Asset Transfer Scheme, effectively advertising its availability to other Site Licence Companies (SLCs) across the NDA's estate. 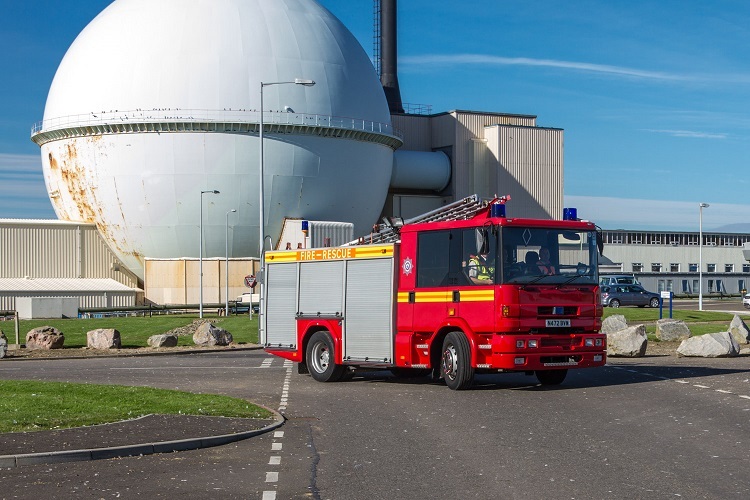 Dounreay Site Restoration Ltd (DSRL) was looking for a third fire engine to ensure that at least two are available at all times, to comply with a requirement from the ONR Inspector for Fire Safety. The fire engine arrived from Suffolk on the back of a lorry, and was formally handed over to DSRL by Sizewell’s former fire team leader Mark Thurston. DSRL’s Fire Chief, Colin Mackay, plans to use the fire engine for at least the next decade. This is another example of the savings in cost and schedule that can be made from using the Asset Transfer Scheme and we encourage DSRL’s project teams to check it regularly. The NDA’s Asset Transfer Scheme database contains items such as vehicles, trailers, cranes, boilers, radiation detectors and much more, all available to SLCs free of charge. The only cost to the SLC is transport.